Richard Paterson has Scotch whisky running through his veins. His grandfather and father were both prominent in the Scotch whisky industry in Glasgow for decades before Richard joined a competing whisky brokerage firm to start his apprenticeship. But this is no dry textbook on blending. Far from it. Humour, insight, history, a love of people and an abiding and evangelical passion inform every page. For the first time one of the world's foremost whisky blenders reveals how he rose through the ranks to top of his profession. He also candidly reveals some of the secrets of his craft and gives his thoughts on where he feels the industry is heading today. Lavishly illustrated in colour and black and white with black and white line artwork, this is destined to become a whisky classic and an essential item on every whisky lover's bookshelf. The most candid insight yet into the art and craft of Scotch whisky blending by one of the world's leading whisky professionals, Richard Paterson of Whyte & Mackay. We’ve been waiting oh so long, with occasional bulletins from Gavin Smith, Fife’s pre-eminent whisky writer – pace Dr. David Wishart; Gavin wins hands down on output. So much so, in fact, that he deserves the accolade ‘the World’s Most Prolific Whisky Writer’… Where was I … Oh yes, over the past three or four years Gavin has been spending all his leisure time (apart from occasional days at the races) with Whyte & Mackay’s Master Blender, Richard Paterson, ensconced in tasteful private hotels around Scotland, smoking large cigars into the night (when such civilised past-times were allowed by the intolerant health-fascists who run the country) and sipping various ancient expressions of Dalmore. Some may have wondered – not least their wives – but we knew better … What we came to talk of simply as ‘The Book’ was slowly taking shape. After eighteen months Gavin happily reported that they had reached 1958 (the book begins in 1949); on other occasions he sadly remarked that his subject, Richard, wanted to ‘go over the last chapter again and re-write bits’, or that he had ‘just remembered something for chapter three’. Anyway, many cigars and bottles of Dalmore later, it’s done, and was launched on a ferry boat, moored alongside the Broomielaw, at the end of October – appropriately, since the City of Glasgow features prominently in the story. And what of the book itself? I read most of it in the business lounge of Chengi Airport, Singapore, where I was trapped for nine hours owing to Quantas doing ‘maintenance’ to the decrepit plane that was to take me on to Melbourne. Neil Wilson, the publisher, furnished me with an electronic copy. What a joy! The nine hours fairly romped by in the company of Richard Paterson! Not least at Whyte & Mackay. One might even say that the many changes at W&M during the last four decades epitomise those in the industry – for good and bad. The move from dedicated, old-school, whisky-men and old-fashioned practices, to rule by accountants, avaricious owners, foreign investment, hostile take-overs: the rush to modernise, without understanding the culture of Scotch, or its history. Richard Paterson was at the heart of the storm. Born into the trade (both his father and his grandfather were blenders), a master blender by the age of 25, survivor of take-overs and re-structuring, respected member of the Top Table of the industry, he is in a position to comment knowingly on what was happening around him in the wider industry. This he does with courtesy and generosity to his peers, from the perspective of an insider. But the book is much more than a ghosted autobiography. Richard’s passion for history – and absurdly precise dates! – make it impossible for him to stick strictly to his own career. So the narrative embraces the entire history of blending, detailed histories of Dalmore, Jura and Fettercairn Distilleries (three of the sites under his control), social mores, the drinking patterns of the late 19th century etc., as well as the whisky history of our times. Also, and perhaps most interesting of all, is his analysis of ‘the blender’s art’. Whisky blenders are notoriously taciturn when it comes to explaining ‘what they do’. Their approach was well summed up by Bill Smith Grant of Glenlivet, not himself a blender, but a distiller of high repute, when he was asked by Time magazine what made his whisky so special. He replied “There’s nothing secret about it. It just comes out like that … I think it’s 99% the water and a certain fiddle-faddle in the manufacture”. Richard compares his own role to that of a host at a dinner party, where the guests are the individual whiskies that go into his blend, chosen and seated to agree with one another and create harmony. ‘Highland chieftains’ (the big Speyside malts), and modified by ‘silky smooth ladies’ (lighter Highland malts), ‘playboys’ or ‘the Vikings of the North’ (to provide excitement), the ‘leading lady’ (a smoky Islay), the ‘efficient staff who present the meal’ (the Lowland malts) and the ‘quiet guys in the background who make the whole party work’ (the grain whiskies). 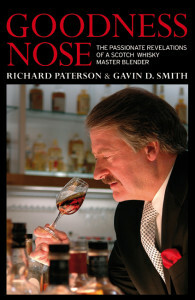 Goodness Nose is an important contribution to the literature of whisky, as well as being an enjoyable read. Gavin Smith, Richard Paterson’s collaborator, has done an excellent job in capturing ‘The Master’s’ voice. We recommend it unreservedly. Why has the book taken so long? Well, the man is a perfectionist, not to mention he seems to spend half his life these days travelling the world to promote Whyte & Mackay blends and their single malts, The Dalmore, Isle of Jura and more. Richard does say he found all the time he spends on planes useful for working on the text. Co-writer (emphatically not ghost writer), Gavin D. Smith, found it a bit frustrating at times but they got there in the end. So here we are just in time for the US holiday and European Christmas season with a terrific gift idea for lovers of Scotch Whisky. What is different about this book? Well, not only is it the story of one notable man's life in the Scotch Whisky industry and delightful anecdotes of others he has met on the way but it also includes a chapter about blending and how Richard approaches it. Some people, removed from the blending side, can work in the whisky industry for a long time and not know this stuff so it's a valuable and fascinating chapter. I found the whole book a great read. If you have been fortunate enough to attend one of Richard's masterclasses at a whisky show near you then you will know the man is a poet when it comes to Scotch Whisky. An ambassador par excellence. There are very few left who can talk so eloquently, amusingly and passionately about Scotch, combined with a vast raft of experience to back it up. That shines through here. You might also know about Richard's passion for dates and history. You'll find plenty of those in the book too. The delay has also allowed him and Gavin to update it since the purchase of Whyte & Mackay by Indian business magnate (beer to airlines) Vijay Mallya last year and to comment on where the industry is now headed. As you might expect, "Goodness Nose" lauds malt whiskies but, most importantly, celebrates blends. In my view, people who look down on blends as a poor relation to single malts suffer from malt snobbery, ill-informed arrogance and a lack of good whisky knowledge. Don't worry; I will say what I mean here! It is an art and a skill and blended whisky is what earns the industry its living. Around 90% of Scotch Whisky sold round the world is still blend despite the chatter round malts which does generate a lot of interest and brings people into Scotch if they haven’t already found their way in via blends. It is the pleasure, not work, of a lifetime to taste them. For anyone who doesn't already know the development of blended whisky you will find it in these pages too. One interesting point made in Richard's own launch speech and in the book is that he was given his first taste of Scotch by his father, a whisky broker and blender, at the age of eight. As he says, it hasn't done him any harm. The point was to educate the boy about the family business and to understand Scotch Whisky – or alcohol and its capabilities in general, not to put him on the path to excessive drinking. He didn't touch it again for some years, it seems. It was his father's careful education which has formed a healthy respect for Scotch Whisky and alcoholic drinks, that we often seem to lack today. Only through education will people understand what these products do but also how wonderful they can be. A number of our European cousins who produce wines seem to have it right. Indeed, some of Scotland's major newspapers reported the book launch next day and applauded Richard's stance on teaching children about alcohol in a sensitive and informative way. This is an excellent buy for the whisky lover and one you will find yourself returning to for information. So we had the launch event and a jolly time where I was able to catch up with friends and acquaintances old and new in the industry. But what did Richard have to say when I caught up with him the next day? Why write the book now? Is it a milestone for your 40 years in the industry? It reflects and looks back. You want to have left something behind if you go suddenly! It's important to me in that it expresses passion and looks at the industry in a different light. What are your major issues for the industry right now? Alcohol abuse. I'd like to go to schools and talk to children – with the consent of their parents. For several reasons, the one which won the Spirit of Scotland trophy in 1994. [Read about it in the book.] Also, The Dalmore 62 Year Old. It took fifteen years to create and the older a whisky is you must allow it at least 12 - 18 months to marry. You first tasted whisky at eight years old. Did you like it then and if not, when did you start? No – I didn't like it then. It was years later, quite slowly and not overnight. It took quite a while. I had to try whiskies and find those that suited my palate; the styles I liked. You need to start at the Lowlands and go from there. Looking at another comment in your book it seems that port and other wine casks, apart from sherry, are not a new idea then? I encountered port casks on joining Teacher's in the early 80's but it didn't do much for the single malt they were trying it on. No they're not a new thing. Sherry influence can make great whisky but it mustn't overpower. There are also many types of sherry including ordinary old brown and different types suit different spirits. You started in the industry in 1966 aged just seventeen. Did you have any notion then of career development or the international opportunities you have now? When I started I got a fright as there was so much to do. I wanted to achieve recognition but knew it would take years. This book is asserting authority of blends and recognising their contribution to the industry. You mentioned your brother in your speech. He was sent to a different school from you – a Naval School. So why no whisky world for him? He went into the Navy and from meeting people there he found that social work appealed. It suited his character better. On page 28, I think, you say your company at that time just put together what whiskies it had for a blend. Was that only the small companies like that one? And are blends today better or more consistent given there are fewer players? Yes it was the smaller ones. The bigger places would have a more formal process of stocks laid down. I would say for the last ten years or so blends and malts have been more consistent due to availability and trade arrangements but also due to consumer demand. Blenders should have stocks to go forward for three or four years to make up any possible differences if a distillery closes or a certain whisky becomes otherwise unavailable. There are a few mentions of accountants in the book. Do you approve of or have much regard for them? Some decisions are taken for the short term and are not good ones if they work on their own. They need to be in harmony with other departments. Are there any old industry practices you'd like to see revived? Marrying of whiskies and doing so with good casks. One good thing from the other side is that there is now better communication. Blenders from different companies do talk to one another which didn't really happen years ago. People or computers in distilleries? Oh God, it has to be people. On another page you say the Scotch Whisky industry realised in the 1970's the vast potential of female drinkers. I disagree. I think it's taken a lot longer and that whisky as a "male" drink persisted for some time. Were Whyte & Mackay ahead of their time? Well one of our ads from the time recognised women drinkers. I see a lot of female consumers of malts too, especially at whisky festivals. I think it's great when you meet couples where both love Scotch Whisky. Chill filtration- yes or no? I'm an advocate of it. If a consumer sees clouds or sediment it's not acceptable. It's an education thing. It does not make a change to the actual spirit – that's been proved recently. It's a kind of cleansing and gives stability on the palate, some polish. It enhances the silky, sensual tones which emerge in whiskies at certain ages. Any dislikes about current whisky practices? Any industry or usage culture which irritates you? Christmas discounting. It's a devaluation of Scotch Whisky. It should never happen. Given the effort which goes into my blends we're not always allowed to price it at the level it should be. Reason for the discounts is in order to keep or gain share. We used to be hung up on age and shouldn't be. In a malt, if there is no age statement, the blender always has older malt in it. The consumer should be aware of not getting a raw deal and know to trust the blender. Do you think most people really take the time to savour their whisky or get to know it on its own before playing with it? No. A connoisseur may, but generally things should be more in-depth to get the character, the style and the story from the palate. Only on the second taste is the palate getting it right. Is there such a thing as a bad blend from Scotland? No, definitely not. Some are better than others. With today's technology and quality control that should not happen. Even at the lowest price levels one may not like the qualities personally but there is nothing bad. Blending - whiskies are like people or personalities to you it seems and should be handled accordingly? Absolutely, one hundred per cent. I have to categorise them in that way. Your descriptions in the blending chapter are very sensual. Do you get that frisson with each sample you nose? Oh yes. You think she's beautiful; she's elegant; she's fine. The descriptions are masculine for some whiskies, feminine for others. It's a partnership. The more communication with someone, the more you fall in love but you also compromise and sort out your differences. It's a constant communication between the components of a blend. There is seemingly so much preoccupation with single malts despite their share. Does that bother you and how do you get round malt diehards to get over your blended message? Campbell Evans [Scotch Whisky Association] hit on it yesterday. Blends are being revived. Blends are still king. We must never lose sight of blends and blended malts. Our Whyte & Mackay 40 Year Old is 70 per cent malt. All the nuances and flavours of each malt are there in blended whiskies. Those trying malts in tastings and then going back to aged blends especially, can see my point here, particularly with blends in the 15 – 22 year age range. Richard is currently looking at some older Dalmores and Juras so treats to look out for in future. Lang may his lum reek as we say over here. Roughly translated that means we hope he's around for along time yet. FOR TOO many years whisky books have tended to focus on single malts, their distilleries and visitor centres, all rounded off with overblown and pretentious tasting notes. Now, at long last, comes a worthwhile book on the bedrock of the industry blended – whiskies, which still account for 90% of the Scotch sold worldwide. Goodness Nose, co-written by master blender Richard Paterson and Tayport-based whisky author Gavin D. Smith, is a solid, informative, entertaining tome that lifts the lid on many unseen aspects of the whisky world. Richard, master blender at Whyte and Mackay, has been immersed in whisky – so to speak – since he was a boy. And over more than half-a-century the Paterson proboscis has nosed nearly one million different whisky samples, from new-fill Glen Dreich to decades-old wonders from the greatest distilleries in the land, so he has plenty to tell. It contains plenty useful advice for would-be whisky connoisseurs – pour the whisky into a proper nosing glass, hold between thumb and forefinger, keep it at room temperature, swirl a few times, put your nose right into the glass (don't sniff forlornly from six inches away) and take plenty time to get the full impact before sipping. Richard says that, to him, nosing alone is sufficient to assess the qualities of the whisky nearly 99% of times. Very rarely will he need to taste a sample – and in most cases it ends up in the spittoon. He also emphasises that good grain whisky from Scotland's seven or eight grain distilleries, is as crucial as the many malts in a good blend and that really good barrels – be they new oak, bourbon or ex-sherry – are almost if not more important than good new spirit to obtain a fine whisky years down the line. He stresses the importance for blenders of ‘marrying’ the mix of 35 or more whiskies for several months in selected casks before the nectar is finally bottled. He also reveals his preferred malts and grains that find their way into his blends. And he discusses how distinctive bottles and labels can help make or break a whisky's repute and sales figures. Sprinkled with good photographs, it is part autobiography, part affectionate portrait of the industry, part snapshot of what goes on behind the scenes. Goodness Nose is also packed with fascinating details, telling anecdotes and historical facts. It is a refreshing book on Scotland’s belweather industry that leaves the reader gladder and wiser – and full of respect for the unseen talents that help ensure Scotch whisky remains the world’s leading spirit. Richard Paterson is one of the world's most prominent whisky blenders working with Whyte & Mackay in Glasgow. Gavin D Smith is a leading whisky writer and journalist with several books on the subject to his credit.